The 386DX Microprocessor is an advanced 32-bit microprocessor designed for applications needing very high performance and optimized for multitasking systems. The 32-bit registers and data paths support 32-bit addresses and data types. The processor addresses up to four gigabytes of physical memory and 64 terabytes ( 2**46 ) of virtual memory. The integrated memory management and protection architecture includes address transition registers, advanced multitasking, hardware and a protection mechanism to support operating systems. 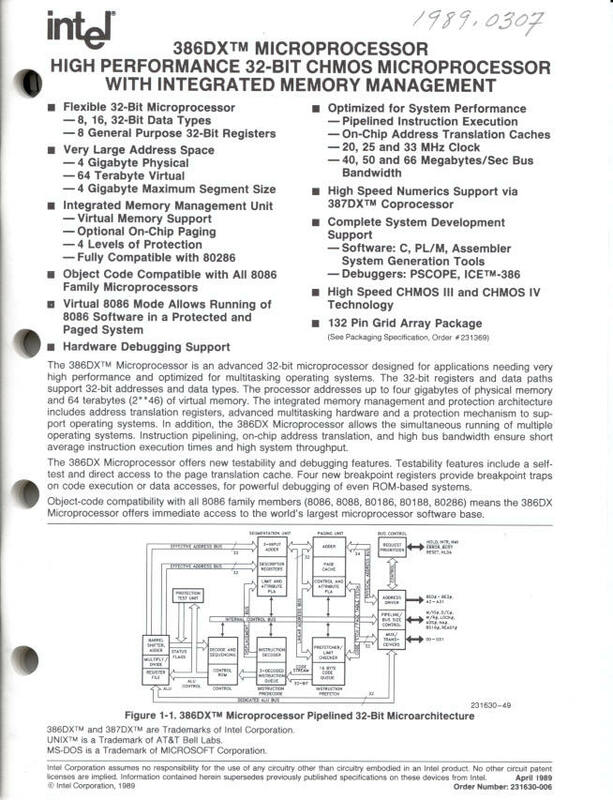 In addition, the 386DX Microprocessor allows the simultaneous running of multiple operating systems. Instruction pipelining, on-chip address transition, and high bus bandwidth ensure short average instruction times and high throughput. The 386DX Microprocessor offers new testability and debugging features. Testability features include a self-test and direct access to the page translation cache. Four new breakpoint registers provide breakpoint traps on code execution or data accesses, for powerful debugging of even ROM-based systems. Object-code compatibility with all 8086 family members (8088, 80186, 80188, 80286) means the 386DX Microprocessor offers immediate access to the world's largest microprocessor software base.